The Fiscal Time Bomb Is Still Ticking! The Congressional Budget Office is by far the most objective source of detailed information about the federal budget, playing a valuable role in the super-charged political atmosphere of Washington D.C. It has just released a new annual report, “The 2015 Long-Term Budget Outlook,” projecting our fiscal health for the 25 year window, 2015-2040, based on current policy. It is a scary scenario indeed. As shown in the above chart, our public debt (on which we pay interest) has increased from 38% of GDP at the beginning of the Great Recession in 2008 to 74% today. Although it will remain steady at this high level for about five years, it will then resume a steady increase, reaching a level of about 100% of GDP by 2040. As many observers, including myself, have pointed out, when interest rates eventually return to their normal historical level of around 5%, interest payments on this huge, and rapidly increasing, debt will double or triple from their current low level, causing a very painful budget shortfall. Simple prudence suggests that the only responsible course of action is to put our debt on a downward path, as a percentage of GDP, in order to minimize this looming problem to the greatest possible extent. Just to keep the debt at its current value of 74% of GDP by 2040 would require an annual 6% increase in revenue or a 5½% decrease in spending. This would amount, for example, to a $210 billion spending cut for 2016. 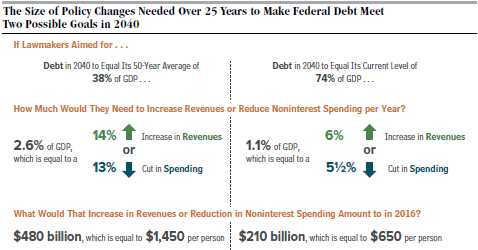 To reduce the debt to 38% of GDP by 2040, its average over the past 50 years, would require an annual 14% increase in revenues or a 13% decrease in spending. The spending cut for 2016 would be $480 billion. These examples show the enormity of the fiscal mess we have gotten ourselves into. Under current policy it will require a big effort just to stay even with where we are right now, without showing any debt reduction over the next 25 years! Our only hope is to change current policy. But how? This entry was posted in Congressional Budget Office, debt, deficit, fiscal crisis, fiscal responsibility, Jack Heidel and tagged congressional budget office, cutting spending, debt, deficit, Deficit spending, fiscal responsibility, GDP, jack heidel by jackheidel. Bookmark the permalink.